Russian Talmudist and preacher; born at Polangen 1755; died at Wilna 1833. Early in life he filled the position of preacher in his native town, and later at Deretschin. He then traveled as a preacher through Germany and Hungary, and, after residing for some time at Breslau, returned to Polangen and devoted himself to literary work. In 1811 he was appointed preacher to the community of Wilna, which position he filled until his death. 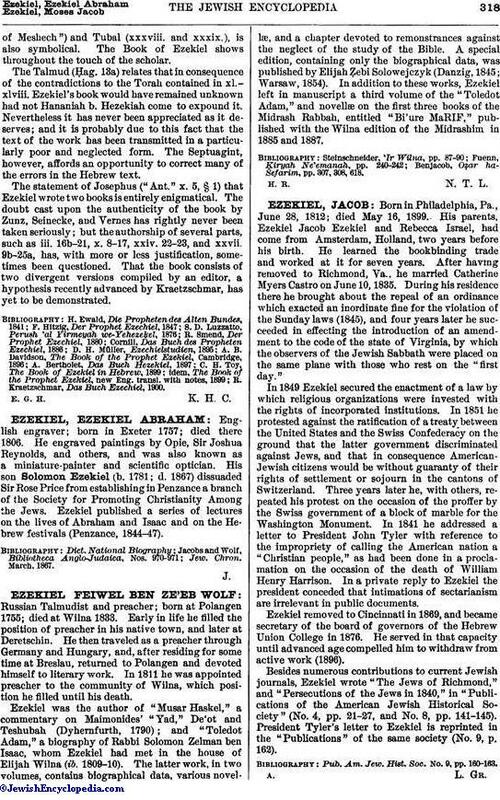 Ezekiel was the author of "Musar Haskel," a commentary on Maimonides' "Yad," De'ot and Teshubah (Dyhernfurth, 1790); and "Toledot Adam," a biography of Rabbi Solomon Zelman ben Isaac, whom Ezekiel had met in the house of Elijah Wilna (ib. 1809-10). The latter work, in two volumes, contains biographical data, various novellæ, and a chapter devoted to remonstrances against the neglect of the study of the Bible. A special edition, containing only the biographical data, was published by Elijah Ẓebi Solowejczyk (Danzig, 1845; Warsaw, 1854). In addition to these works, Ezekiel left in manuscript a third volume of the "Toledot Adam," and novellæ on the first three books of the Midrash Rabbah, entitled "Bi'ure MaRIF," published with the Wilna edition of the Midrashim in 1885 and 1887. Benjacob, Oẓar ha-Sefarim, pp. 307, 308, 618.